Like children, every water year is different, but 2018 is now hanging out with some of the most notorious low-flow years in history. 2018 started with a thin snowpack that ran off early and now has found trouble in a hot and dry summer. The Bureau of Reclamation determined this week that 2018 had produced the fifth-lowest amount of runoff from the Colorado and Green rivers down to Lake Powell, between April and the end of July. That puts 2018 behind only 2013, 2012, 1977 and 2002, the low-water mark. 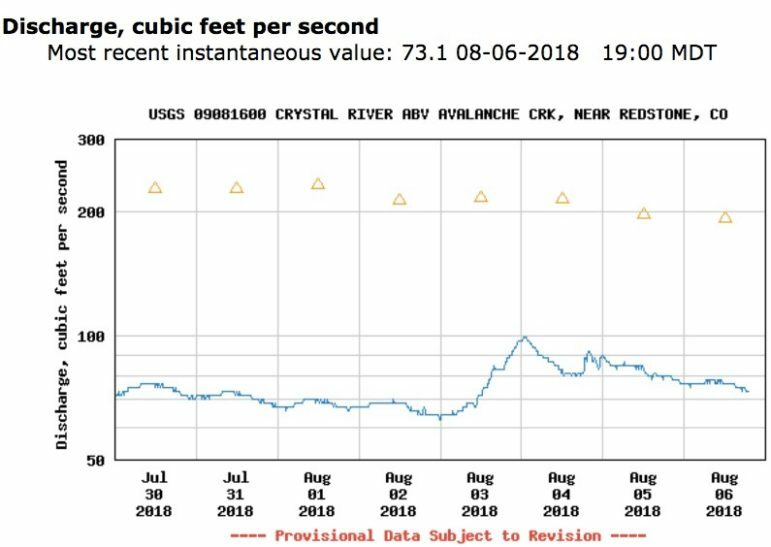 And locally, 2018 is now revealing dry reaches in the Roaring Fork and Crystal rivers not seen since 2012 or 2002. 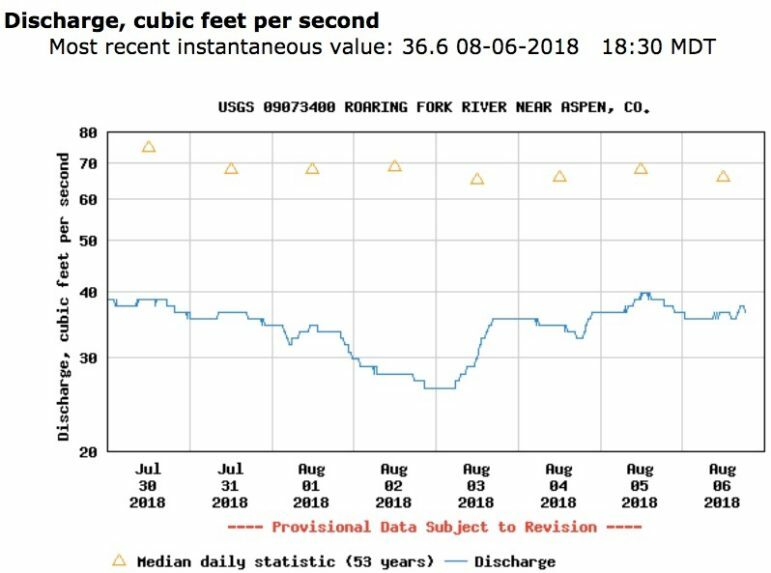 Friday, Aug. 3, just before noon, the upper Roaring Fork River was dribbling through Aspen at 9.12 cubic feet per second, according to a gauge maintained by the Aspen Center for Environmental Studies, well below the environmental flow level of 32 cfs set by the state. 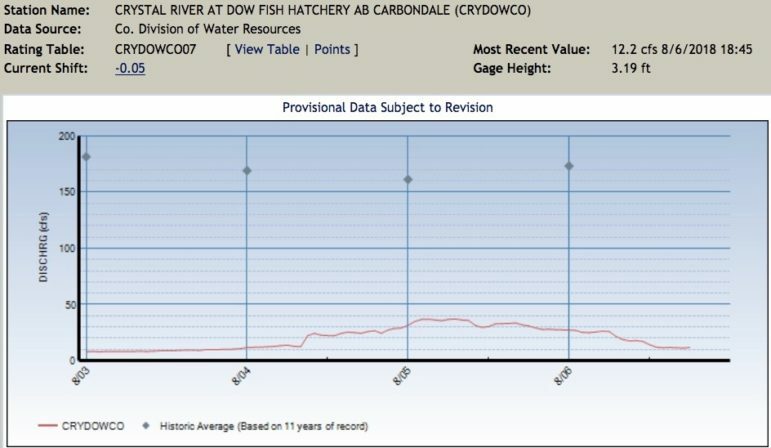 Also Friday morning, which saw some rare rain to the valley, a section of the lower Crystal River just above the state fish hatchery outside of Carbondale was barely running at 8.86 cfs, according to a gauge maintained by the Colorado Division of Water Resources. The state’s environmental flow level in that reach of the Crystal is 100 cfs, and the 2016 Crystal River Management Plan set a less-ambitious flow target of 40 cfs for the reach. Hunter Creek in Aspen was “flowing” at 0.48 cfs at its confluence with the Fork on Friday, according to gauge maintained by USGS. That’s less than even half-a-basketball full of water in the stream bed. This year already has a bad reputation on Colorado’s Western Slope, and especially in the southwest corner, which remains under exceptional drought conditions. “Hydraulically, 2018 is stacking up across western Colorado as, potentially, depending upon your specific location, the driest year on record,” said John Currier, the chief engineer for the Colorado River District. Another indicator of how dry 2018 is shaping up to be is the gauge on the Roaring Fork River at Stillwater Road, just east of Aspen. The gauge showed the Fork on Friday was flowing at 28 cfs, without any significant upstream diversions dropping the flow. The lowest flow on Aug. 3, in 53 years of record-keeping, was in 2002, when the river was flowing at 31.7 cfs. A similar indicator can be found on the Crystal River at the gauge that measures the river’s flow below Redstone, and above a series of diversion structures on the lower river. Friday morning, that gauge showed the Crystal flowing at 68.5 cfs. The lowest flow on Aug. 3, in 62 years of record keeping, was in 1977 when the river was at 64 cfs. 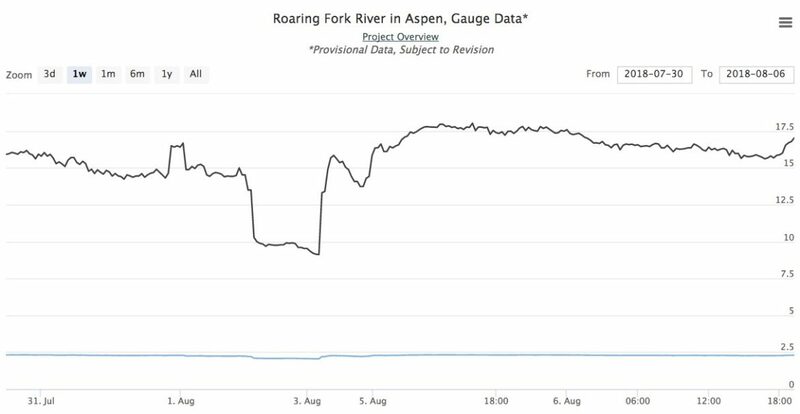 In response to such low flows in the region, the River District on July 27 started releasing water it controls out of Ruedi Reservoir into the Fryingpan River, something it has not arranged to do since 2002. By increasing flows by about 80 cfs up to 200 cfs in the lower Fryingpan, which runs into the Roaring Fork in Basalt, the District’s water helped cool the warm water in the Fork down to its confluence with the Colorado River in Glenwood Springs. The water then also helped boost flows in the Colorado River near Grand Junction, where senior water rights known as “the Cameo call” are still calling for more water. Such calls are often met by releasing water from Green Mountain Reservoir, south of Kremmling. But the River District and other water managers want to keep as much water as they can in Green Mountain until September, and the water released from Ruedi helps with that. There was the added incentive this year to add water to the Fork and Pan to dilute the still-expected flow of ash and mud from Basalt Mountain in the wake of the Lake Christine Fire and the next heavy rainstorm. There’s no easy way, however, to add water to the nearly-dry sections of the upper Roaring Fork and the lower Crystal rivers. On Friday, for example, no water was being diverted upstream off the top of the Fork via the Twin Lakes/Independence Pass diversion system, according to a record of its diversions, and a related 3,000 acre-foot allotment of water that can be used to bolster flows already has been sent downstream. In response to the low-flows, the city of Aspen has dropped its diversions into the Wheeler Ditch, which takes water from the Fork near the Aspen Club, from a potential maximum diversion of 10 cfs down to 0.5 cfs. On the Crystal, a non-diversion agreement between the Colorado Water Trust and Cold Mountain Ranch, which diverts water from the Crystal, was not implemented this year, despite the dry conditions. The agreement was meant help boost moderately low flows in the Crystal of around 40 cfs, not to help bring the river up from, say, 10 cfs to 25 cfs, which may not help the environment that much. “If it’s not going to have an ecological benefit, it is not worth irrigators making the sacrifice,” said Heather Tattersall Lewin, the watershed action director at the Roaring Fork Conservancy. On Thursday evening, Jim Kravitz, the naturalist program director at the Aspen Center for Environmental Studies, took note of the distressing lack of water in the upper Fork and lower Hunter Creek. Editor’s note: Aspen Journalism is covering rivers and water in the Roaring Fork and Colorado river basins in collaboration with The Aspen Times and the Glenwood Springs Post Independent. The Times published this story in its print edition on Sunday, Aug. 4, 2018, as did the Post-Independent.